Damning testimonies gathered by Amnesty International reveal that the Nigerian security forces failed to act on advance warnings about Boko Haram’s armed raid on the state-run boarding school in Chibok which led to the abduction of more than 240 schoolgirls on 14-15 April. After independently verifying information based on multiple interviews with credible sources, the organisation today exclusively revealed that the Nigerian security forces had more than four hours of advance warning about the attack but did not do enough to stop it. “The fact that Nigerian security forces knew about Boko Haram’s impending raid, but failed to take the immediate action needed to stop it, will only amplify the national and international outcry at this horrific crime. “It amounts to a gross dereliction of Nigeria’s duty to protect civilians, who remain sitting ducks for such attacks. The Nigerian leadership must now use all lawful means at their disposal to secure the girls’ safe release and ensure nothing like this can happen again. Amnesty has confirmed through various sources that Nigeria’s military headquarters in Maiduguri was aware of the impending attack soon after 7pm on 14 April, close to four hours before Boko Haram began their assault on the town. But an inability to muster troops – due to poor resources and a reported fear of engaging with the often better-equipped armed groups – meant that reinforcements were not deployed to Chibok that night. The small contingent of security forces based in the town – 17 army personnel as well as local police –attempted to repel the Boko Haram assault but were overpowered and forced to retreat. One soldier reportedly died. More than three weeks later, the majority of the girls remain in captivity in an unknown location. A climate of confusion and suspicion has so far scuppered efforts to secure their release. Amnesty reiterates its call on Boko Haram to immediately and unconditionally release the hostages into safety and stop all attacks on civilians. Between 7pm on 14 April and 2am on 15 April, the military commands in Damboa, 36.5 km away from Chibok, and Maiduguri, 130 km away from Chibok, were repeatedly alerted to the threat by both security and local officials. According to sources interviewed by Amnesty, local civilian patrols (known as “vigilantes”, set up by the military and local authorities) in Gagilam, a neighbouring village, were among the first to raise the alarm on the evening of 14 April after a large group of unidentified armed men entered their village on motorbikes and said they were headed to Chibok. This set off a rapid chain of phone calls to alert officials, including the Borno State Governor and senior military commanders based in Maiduguri. Another local official was contacted by herdsmen who said that armed men had asked where the Government Girls Secondary School was located in Chibok. At around 11:45 PM, a convoy reportedly numbering up to 200 armed Boko Haram fighters – on motorbikes and in trucks – arrived in Chibok town and engaged in a gunfight with a small number of police and soldiers based there. Outnumbered and outgunned, the security forces eventually fled in the small hours of 15 April. Some of the Boko Haram fighters proceeded to the Government Girls Secondary School and abducted more than 240 schoolgirls. Amnesty’s requests for a reaction from the military headquarters in Abuja have gone unanswered. Since the 14 April raid, a climate of confusion and suspicion appears to have slowed down the Nigerian authorities’ efforts to locate and free the abducted schoolgirls. On 16 April, a senior Defence Ministry spokesperson said that almost all of the abducted girls had been rescued and only eight were still missing. The next day he had to retract that statement. Amnesty is calling on the Nigerian government to provide adequate information to families of abducted girls on the authorities’ current efforts to ensure their safe release. The families – and the abducted girls, once they are freed – must be provided with adequate medical and psychological support. The information on the advance warnings of the impending Boko Haram attack in Chibok came from multiple sources, including local officials and two senior military officers, interviewed by Amnesty. The sources independently verified a list of Nigerian officials who were alerted on 14-15 April, before and during the raid on the Government Girls Secondary School. They have been kept anonymous for their safety. The abduction of the schoolgirls in Chibok comes amid months of worsening violence and serious human rights violations and abuses being committed by armed Islamist groups and Nigerian government forces alike in the conflict in north-eastern Nigeria. 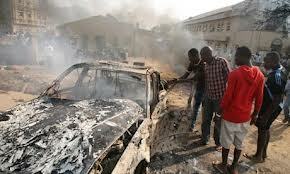 Amnesty’s research indicates that at least 2,000 people have been killed in the conflict in Nigeria this year alone. In a separate incident on 5 May, at least eight girls were abducted by gunmen in the Warabe and Wala communities in north-eastern Nigeria. There have been similar abductions on a smaller scale, mainly of women and girls, in the last two years. Also on 5 May, more than 200 people were killed in Gamboru, Ngala, Borno state, when an armed group traveling in two armoured cars opened fire on a market in broad daylight. The attack began around 1:30pm and lasted several hours, and the armed group torched market stalls, vehicles and nearby homes and shops. Despite such ongoing attacks, the Nigerian authorities have failed to adequately investigate the killings and abductions, bring suspected perpetrators to justice, or prevent further attacks. At the same time, the government continues to unlawfully detain hundreds of people suspected of links with Boko Haram in military detention and is denying them access to lawyers. The majority of those detained around the country are held without criminal charges, and many have been extrajudicially executed by security forces before facing trial.